Due to injuries that I suffered when hit by a distracted driver two years ago, I have had to abandon my fleet of road and ’cross bikes in favor of a recumbent. I purchased a used Schlitter Encore, which came with a SRAM mechanical MTB triple groupset with bar end shifters. I hated the shifting. I swapped to Shimano RS700 flat bar shifters combined with an Ultegra RX800 clutch rear derailleur, an FD8000 front, and an FSA K Force Light 50/34 compact crank. The shifting performance improved, but I am having issues with the rear. It sometimes struggles to shift to a higher gear, and all attempts at adjusting it on my own in accordance with the Shimano manual specs don’t improve it. I have concluded that the problem is the extremely long cable used on the bike. I am considering setting up the bike with Di2 shifters. I have two issues. Are there any flat bar Di2 shifters (eg XTR) that will work with road Di2 derailleurs? If the answer to my first is yes, does Shimano offer very long Di2 wiring that I can use to hook up the rear mech? See the photo of my Encore (above) that gives you an idea of what I am dealing with. Your road bike maintenance books have saved me many times! Absolutely, there is such a solution! Just make sure you don’t mix derailleurs, however. As long as you use both road Di2 front and rear derailleurs (Dura-Ace or Ultegra) along with the Di2 MTB shifters (XTR or XT), it will work. Road Di2 shifters will also work with MTB Di2 front and rear derailleurs, but neither shifter set will work with an MTB front derailleur and a road rear derailleur, or vice versa. Also, I think that using the Di2 full Synchro Shift (“S2” mode) will be a tremendous advantage on a recumbent. We recently built a custom titanium bike with the same shifting system you want and for similar reasons; the guy we built it for also needed a unique bike due to being hit by a distracted driver. He is a triathlete who was hit on Alii Drive in Kona a few days before the Ironman World Championships eight years ago. He still raced that Ironman despite the severe injury he suffered, but his cervical spine deteriorated rapidly afterward. He now has a pair of long rods implanted in his back on either side of his spine that go all the way up to the base of his skull. The rods prevent him from being able to turn his head or tilt his head back. Since he can’t lift his head if his torso is leaned forward in a riding position, he needs to sit bolt upright. Hence the ape-hanger handlebar and super long head tube and fork steering tube. We built his bike with a banana seat custom made out of carbon fiber by Craig Calfee and a custom titanium sissy bar from Black Sheep supporting it with multiple water-bottle mounts on it. The long saddle allows him to sit in numerous positions, and the sissy bar gives him something to push against when sitting upright, because pulling on the bar in that position accomplishes nothing. There is a video camera mount on the sissy bar below the saddle, which enables him to view what’s behind him on a screen on his handlebar, since he can’t turn to see what’s there. The custom titanium ape-hanger handlebar includes a drop bar that he can pull on when standing out of the saddle and which supports an aero bar (with Di2 remote shift buttons on it) that he can ride while keeping his head up by sliding to the forward tip of the banana seat. Shimano’s Di2 Synchro shifting allows uncompromised riding with all sorts of injuries. If shifting with one of the hands is impossible and the rider still wants a double or triple front chainring, then S2 (full Synchro-Shift) mode allows all of the shifting to be done with one hand. It also doesn’t matter which hand; by using either a tablet or smartphone and a wireless app or a PC and a wired interface, you can customize which shifter does what. In your case and in the case of the rider we built this bike for, S2 Synchro-Shift mode allows you to make intelligent shifts without ever needing to see what gear you are in. (While looking back would be impossible for him and may be for you on the recumbent, you do have the option of viewing the gear combination on an MTB Di2 digital display or on a Garmin or other ANT-enabled and Di2-knowledgable bike computer?) 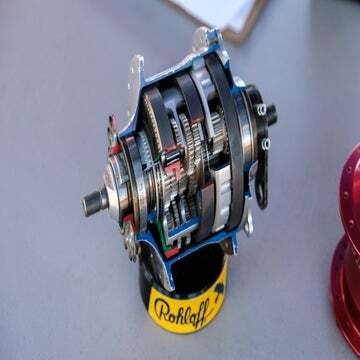 It takes consistent gear steps for maximal use of your gear range; you get unique, evenly-spaced gear ratios without jamming or dropping the chain. 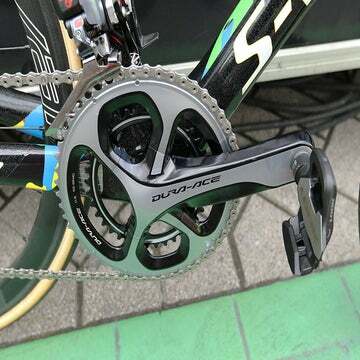 In S2 mode, it will keep the chain on the big chainring while downshifting through the first 10 cogs from the smallest to the second-largest rear cog; only then will it finally shift to the inner chainring at the same time that it drops the chain back down one or two rear cogs. And then it goes through the lowest gear combinations from the small front ring to the biggest rear cogs. On the way up, it stays in the inner chainring as you shift to ever-smaller rear cogs until about mid-cassette, when it (after warning beeps) shifts to the big chainring while shifting back to larger cogs. Don’t like when it makes which shift? 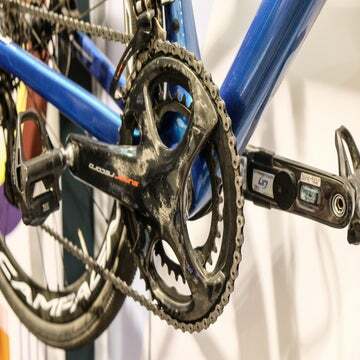 You can program where on the rear cassette you want the front shifts in either direction to occur as well as how many cogs it shifts back in the opposite direction when doing the double shift. To answer your second question, Shimano makes Di2 E-Tube wires up to 1400mm in length. If that is not long enough, you can use an EW-JC200 2-port junction or a second Junction B to splice two wires together.